You’d be hard pressed to find a person who loves Devon more than me. At weekends I’m more than happy exploring our coastal towns and beaches and walking the moors. Sometimes you just need to change it up though, right? I’d heard the Gower’s beaches were the best in Wales and I found a company with luxury Shepherds Huts overlooking Rhossili beach, so off my husband and I went, for a glamping adventure on the Gower. It took just three hours to drive to Rhossili on the Friday night. I squealed in delight when I saw our Shepherds Hut – it looked beautiful lit up with fairy lights. 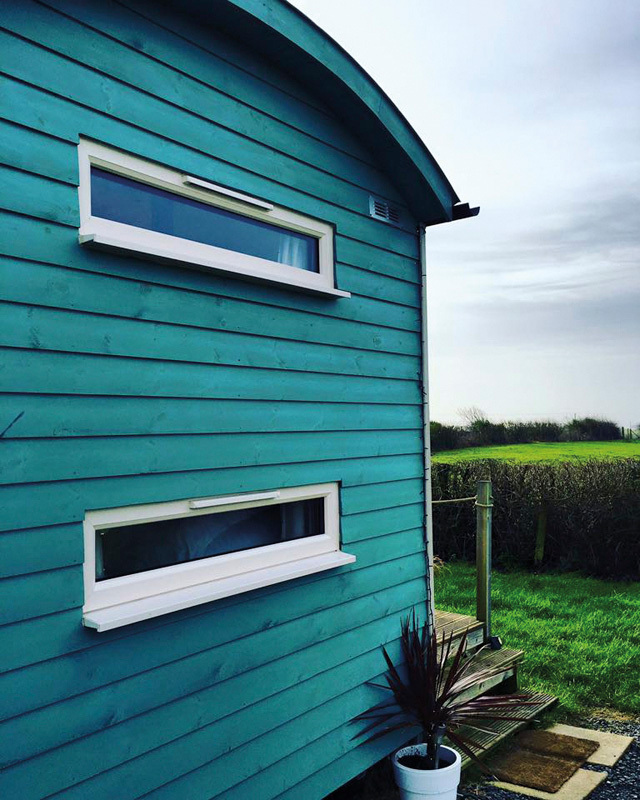 Inside it was a haven – done in a beautiful beachy style out with everything you could ask for – a comfy double bed that turned into a sofa, a super-cute but fully functional kitchen and bunk beds if you’ve got little ones. It even had its own private toilet in a separate hut outside. The bedding was crisp, there was a bale of soft towels and the kitchen was stocked with Welsh goodies for a cooked breakfast complete with yummy welsh cakes. We visited the King’s Head in Llangennith for dinner – a four star olde-worlde inn which oozed character with exposed beams and beautiful stonework. The menu variety was impressive with nearly all of it homemade and based on fresh Welsh produce. I opted for a Welsh rump steak which was juicy and flavoursome, served with homemade chips, a roasted flat mushroom, tomato and onion wedge. Following a recommendation from the friendly locals, we also sampled the Gower Gold ale, which had a refreshing citrus flavor. Despite the weather not really playing ball, the view from our Shepherds Hut was breathtaking. Inspired, we got waterproofed up and walked down to Rhossili beach. The views on the way down were magnificent and the beach itself didn’t disappoint, with three miles of golden sandy shore, encompassing one of Gower’s most famous landmarks, Worms Head. Even on a cold and windy day there were plenty of surfers enjoying the Atlantic swell. I’d already decided to revisit in the summer with my board (I’m not ashamed to admit I’m a fair-weather surfer) and to hopefully catch a glimpse of basking seals or dolphins playing in the surf, which is common for this stretch of coastline. Later in the day we headed to Mumbles, which is a Victorian fishing village, with expansive views out over Swansea Bay. The sun came out so we headed to Verdi’s, an Italian café and ice cream parlour, where I begrudgingly shared a Hazelnut Basket with Hot Chocolate Fudge Sauce with my husband. Like Ferrero Rocher, but nicer – a must visit if you’re in the area. 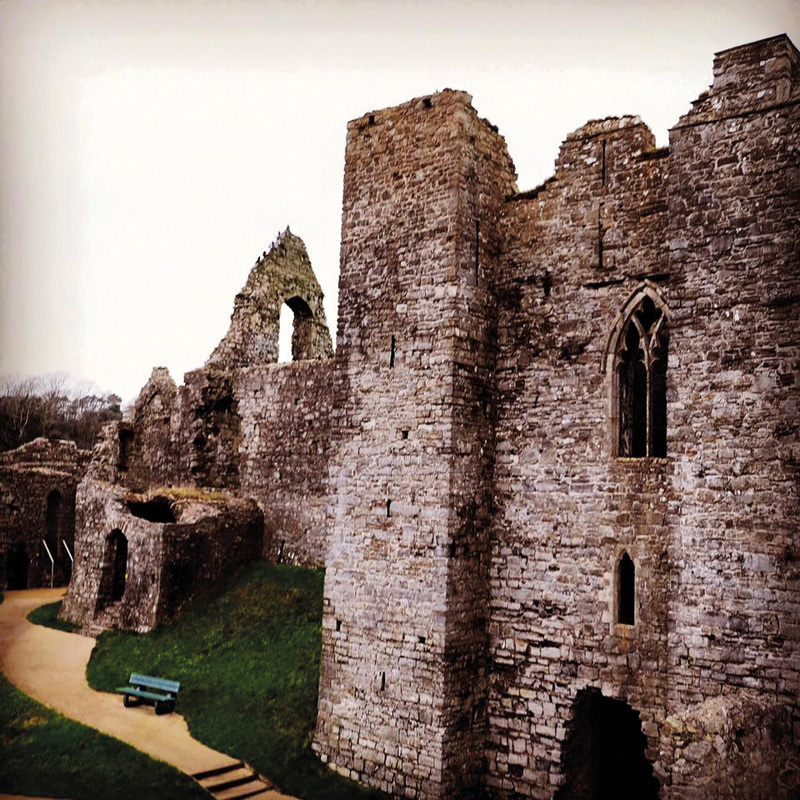 We also paid a visit to Oystermouth Castle. We’d booked a tour in advance and were lucky enough to be shown around by Roger Parmiter, who brought the experience to life for us with his infectious enthusiasm and knowledge. We explored the medieval maze of deep vaults and secret staircases, talked about ghosts and marveled at ancient graffiti art from the 14th century! On the Saturday evening we visited the King Arthur Hotel in Reynoldston. We were impressed to pull up and see landscaped gardens, with a lily pond, waterfall and views over the Gower countryside! Inside was cosy and characterful and we enjoyed a pan roasted Brill dish that was cooked perfectly. 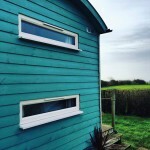 I was sad to check out of our Shepherd’s hut on Sunday – it had been the most amazing base from which to explore and I would have liked to spend more time drinking coffee in the driftwood chair on the deck and staring out to sea! 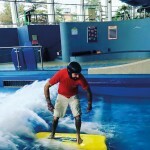 It was time to work off some of that food, so we headed to South Wales’ Premier Waterpark and Leisure Complex, the LC, where we tried indoor surfing, which was brilliant fun (and warm). 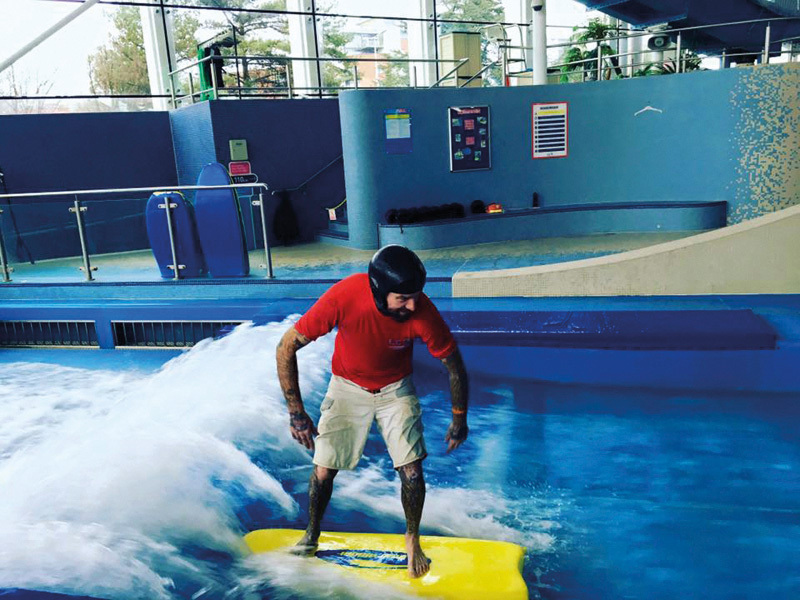 With the help of the friendly instructor both my husband and I were up and riding the wave in no time. After we’d changed we tried the LC’s 30ft climbing wall, which was a great adrenaline rush! Before the drive home, we lunched at Cafe TwoCann, which is situated in one of Swansea’s original dock buildings. 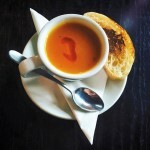 It’s tasteful, contemporary interior combined with the character of the building was just to my taste, as was the menu! 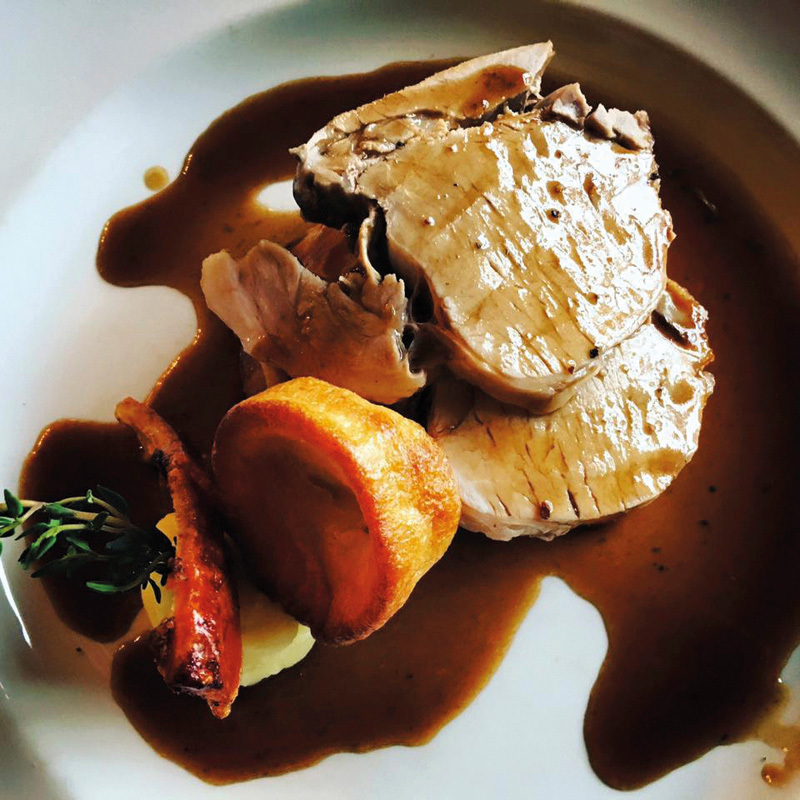 My roast pork dinner was the best Sunday fare I’ve had for a long time (sorry, Mum) – everything surpasssed my expectations in terms of taste, food quality and also presentation. I figured I’d used enough calories surfing to warrant a dessert and was wowed by the creamy citrus delight that is their lemon posset. Delicious! 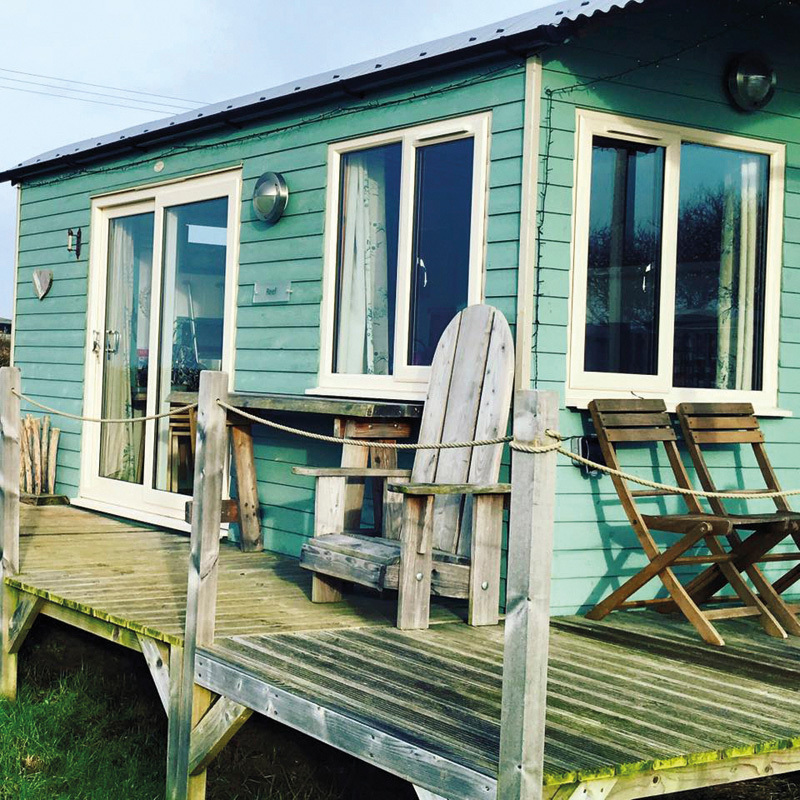 I left Wales with a full belly, a happy heart and a resolution to return for some surfing at Rhossili and another glamping adventure when the weather’s warmer.